Pictured from left: Southwestern Energy Community Relations Manager Amy Dobkin, Variety CEO Charles LaVallee, Emma Simmons, David Simmons and Central Elementary teacher Lara Himrod. Variety- the Children’s Charity and Southwest Energy teamed up to help transform the lives of local kids with disabilities. 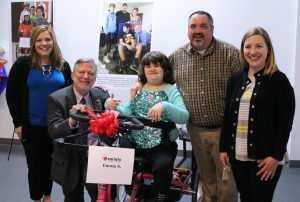 During a special presentation on Thursday afternoon, Variety presented five adaptive bikes, two adaptive strollers and one communication device to eight different Ohio Valley children. In total, this was $13,200 worth of adaptive equipment given to the youngsters free of charge. Southwestern Energy picked up $10,200 of the cost while additional funding was pulled from donations made to Variety. One of the kids who received an adaptive bike and a communication device is Emma Simmons, a 4th grade student at Central Elementary School. Her father, David, knows this donation will not only impact his daughter’s life but the entire family as well. The generous donation made to Emma will not only give her exercise but will give her a way to communicate with loved ones. “To be able to speak to their parents, grandparents, aunts and uncles. To be able to communicate with them is just a wonderful thing,” David Simmons explained. Variety is striving to build momentum in identifying eligible children that could benefit from their own adaptive bike, adaptive stroller and communication device. Variety hopes that the community can help spread the word, so that no child misses out on this life-changing equipment. For more information about the charity or to apply for help, please visit usvariety.org.